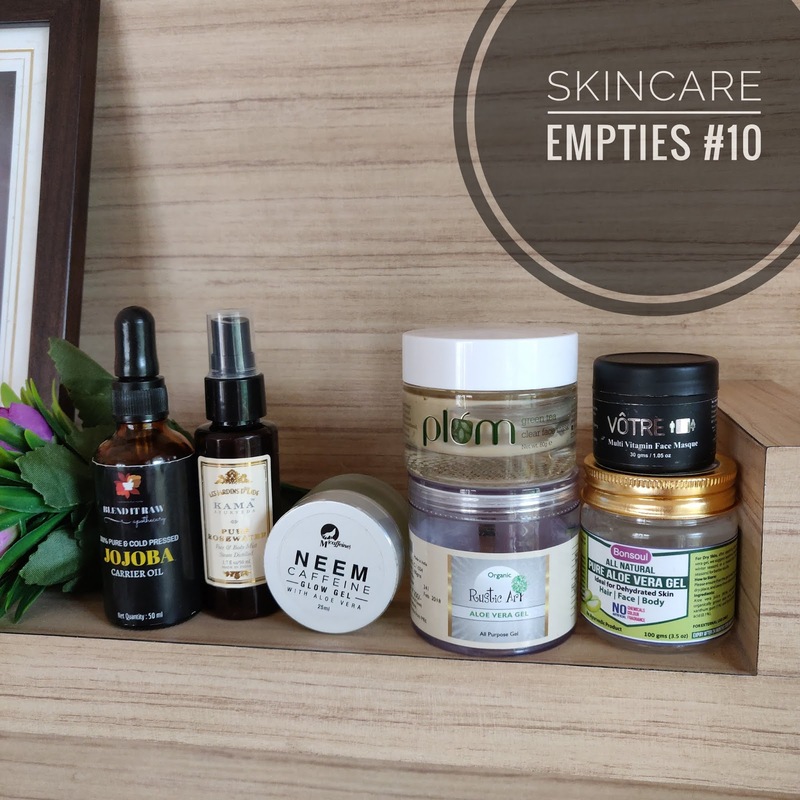 Am really really happy that am able to empty more and more products and keep on getting to know what works for me and which products are good and which are good enough to be repurchased. 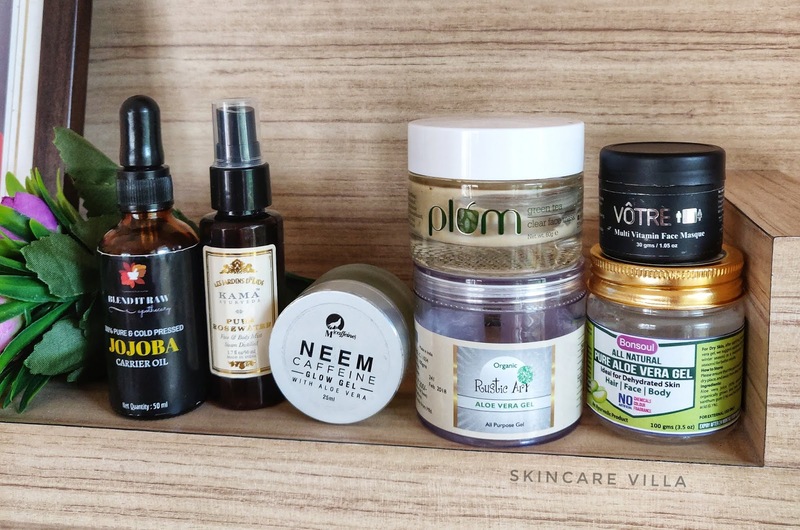 Let's head straight to the list and see which all products are worth the hype. Plum Green Tea Clear Face Mask is my cult favourite and I have already stocked up two tubs as there was 25% off on Amazon. It's a good face mask if you have oily acne prone skin and get breakouts. The mask even treats nodule acne and cystic acne. I ended up using this one for my hair after keeping it for longer than 6 months. I made up a Shea butter hair mask for my hair and used this oil in it along with rosehip oil from Blend It Raw. This also can be used as a leave in conditioner or a normal hair oil too. Be sure to use very little as less is more with this oil. Although I won't be repurchasing this one and will be trying some other brand for Jojoba Oil. I picked up this one from theecostore.in for my skin, but after looking at the incomplete ingredients list I used it on my hair. After using it for a few weeks in my hair as a pre wash mask it makes my hair less frizzy and also gave it some soft curls. I am going to repurchase this one for my hair. Bonsoul Aloe Vera Gel is a good gel for face. They use fruit derived malic acid as a preservative and use organic aloe vera gel. Although I ended up doing more of experiments on my face with this one. I will be repurchasing this one. I find this gel ok sort. It is a very hydrating gel which ultimately brings a glow to the skin. However the fragrances and preservatives used are not fully disclosed so I would like to skip this one. Kama Ayurveda Rose Water is pure love. I had won this one in Madhu's giveaway on Instagram. This reduces pore size and acts as an excellent astringent or toner for skin. I might repurchase this. Keeping in mind the high price tag of this product I will skip this, but yes the fragrance and consistency of this mask is amazing. I would love grabbing this one at low price 😉. So this was my empty list, what all did you empty in past few months? Vedantika Instant Glow Mask, fails to deliver!